Manchego is undoubtedly Spain's most famous cheese. It is made only on the plain of La Mancha from the milk of the Manchega sheep which graze on the shrubs and grasses of the Dahesa and produce a thick, aromatic milk that gives Manchego a unique and distinctive character. The true Manchego cheese is made only from whole milk of the Manchega sheep raised in the "La Mancha" region. This region is a vast high plateau, more than 600 meters above sea level, which extends from east to west and north to south, adjoining the provinces of Toledo, Cuenca, Ciudad Real and Albacete, all in the Castile-La Mancha Region southeast of Madrid. Originally the rinds of the Manchego's bore the impressions of the plaited esparto grass baskets into which the shepherds hand pressed the curds and of the flowers that were placed on top. Nowadays the same patterns are imparted by the moulds in which the cheeses are pressed. 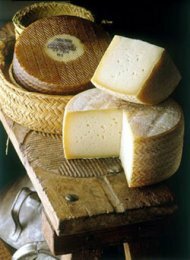 Manchego is an aged cheese, from semi-cured to cured, made only with milk from manchega sheep breed, unpasteurised or pasteurised. It is produced through an enzimatic coagulation. The paste is pressed and uncooked. The base milk has to have a minimun of 6% fat. The milk coagulates at 28 to 32 º C after adding animal curd. Occasionally lactic ferments and calcium salts are also added. This results in a compact curdle within 45 to 60 minutes. The curdle must then be cut to obtain lumps of 5 to 10 mm. (1/5" to 2/5"). The resulting lumpy paste is then slowly reheated to about 40ºC (104ºF) The liquid is removed and the dried paste put into molds where it is pressed for several hours. The salting is external and is achieved either by rubbing with dry salt, by immersing the cheese in highly salted water, or by a combination of both methods. The percentage of the salt in the weight of the cheese can not be higher than 2.3% after two months of aging. The aging process must be done in fresh areas, with a humidity level of 75 to 85%, for at least 60 days. The rind is closed, clean well engraved, of a yellow to a brownish beige colour. The interior is firm and compact, closed, with a few small air pockets unevenly spread. The color is ivory to pale yellow. The taste is very characteristic, well developed, but not too strong, buttery and slightly piquant, with an sheep milk aftertaste. The shape is cylindrical, with flat top and bottom surfaces engraved with the tipical "flower" left by the wooden presses. The sides show a zigzag pattern produced by the mat-weed (esparto) of the moulds. Today, industrially produced cheeses have the same engraving, predesigned in the new industrial moulds.